Let's see if you notice? I believe Ghost said back on topic....unless you want to continue to act like a third grader sucking up to teacher and unable to handle the truth !!! The P61 Black Widow also had counter rotating props. I am not sure about the B26 or A20 ? Anyone know ? It's worth mentioning that Il-2 (Flying Heritage) was restored with an Allison engine. Most Il-2s seem to have had left-hand props, but it doesn't appear to have been universal- at least some static aircraft have right-hand props. My understanding is that the AM-38 had a reversible crankshaft so that the rotation of the engine could be easily changed to facilitate use in different aircraft. The AM-38 was only ever produced for use on the Il-2, but this feature was probably derived from its progenitor, the AM-34, which was developed for use in early Soviet aircraft like the TB-3 (although it doesn't appear as though any of these aircraft ever took advantage of counter-rotating props). The Allison V-1710 had the same feature, meaning the majority of engine parts were interchangeable between left and right engines in the P-38. This is unlike actually the majority of multi-engined warbirds that don't have counter-rotating engines- RR Merlin, Bristol series, P&W Wasp, Wright Cyclones were all produced overwhelmingly as single-handed. What I mean by this is that your Beaufighter, Mosquito, Lancaster, Halifax, B-17, B-24, B-25, P-61... pretty much everything actually didn't have counter-rotating props. The feature is perceived as having been far more common than it actually was, and really the only noteworthy production aircraft of the WW2 era with counter-rotating props are the P-38, twin Mustang (which both used Allisons), Hs-129, and De Havilland Hornet (which both had designed "handed" engines). You can check photos of these aircraft if you don't believe me and see that the props are the same on both left and right. This should make complete sense as parts commonality and ease of repair is far, far more important for a combat aircraft than countering yaw on takeoff (which is a touch of grace). According to wiki, this feature is why Flying Heritage chose to restore their Il-2 with an Allison, although I suspect the fact that a working AM-38 is basically a moon rock played a pretty major factor as well. Edited by vonluckner, 01 November 2017 - 06:50 AM. Most multi engine aircraft have counter rotating propellers to balance torque & asymmetric blade effect(p-factor) that would otherwise cause unwanted yaw of the aircraft. As BrushWolf stated the B-25 did not have counter rotating propellers. Actually, most do not. Most simply counter-act the P-factor with rudder input. Counter-rotating props were actually really rare. The P-38 was one such example, but it's one of the only ones. 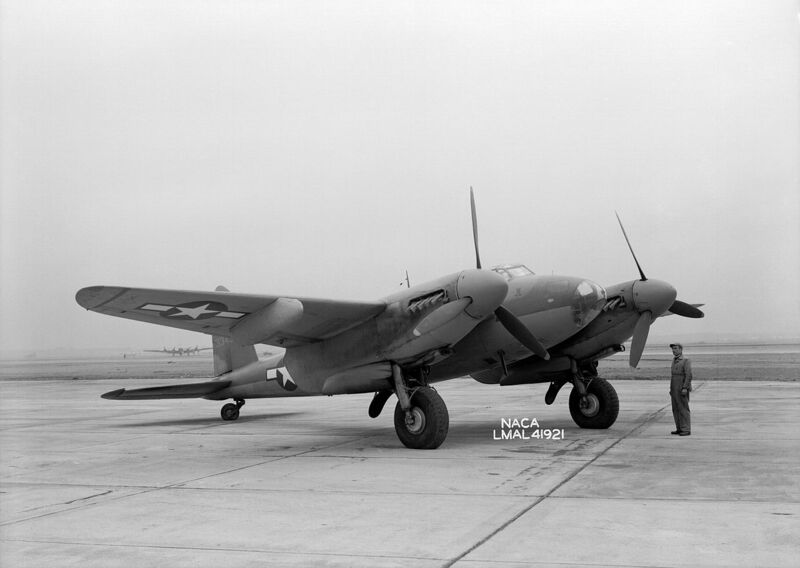 Even early P-38s didn't have counter-rotating props. They went with counter-rotating props to make it a more stable gun platform. Edited by ramp4ge, 02 November 2017 - 04:51 AM.